Interstate Electrical Services Corporation is the recipient of a 2017 Excellence in Construction award from the Connecticut division of the Association of Builders and Contractors (CT ABC). Awards were announced at the 15th annual Excellence in Construction awards ceremony on October 26th at the Aquaturf in Southington, CT. The event honored construction companies and subcontractors who performed work on outstanding construction projects completed as of October 2017. Interstate won the Excellence in Construction award for its work on the Columbia Gas Operations Center Campus in Springfield, Mass. 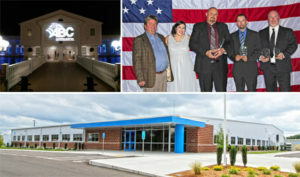 Interstate’s Connecticut team worked for a year to provide engineering, design and electrical construction of a new operations center, new materials depot, and the electrical design renovation/fit-out for an existing meter shop totaling 56,000 square feet.For this project, Interstate team members Eric Bulgarjewski and Shane Calabrese were honored as outstanding field personnel for the their dedication to excellence and site safety. In addition to the Excellence in Construction award, Interstate received further accolades for another project, the multi-use building at 24 Colony Street in Meriden, Conn. Interstate was recognized as the specialty electrical contractor for the job, and Interstate team member Edward Wadsworth was highlighted as the one of the outstanding field personnel.